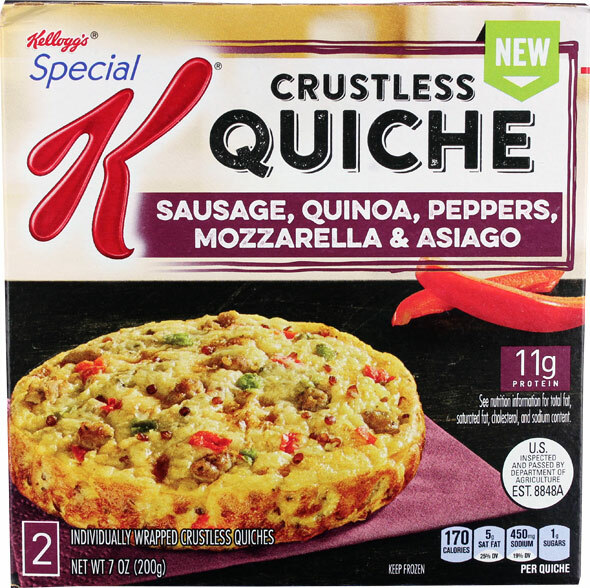 I tried two varieties of Special K Crustless Quiche: 1) Sausage, Quinoa, Peppers, Mozzarella & Asiago; and 2) Uncured Ham, Cheese, Quinoa & Peppers. Both were very good, but I preferred the sausage variety by a large margin. Both versions are promoted as providing 11 grams of protein per serving. A box contains 2 servings (2 quiches). The Sausage, Quinoa, Peppers, Mozzarella & Asiago variety was pleasantly spicy with a terrific sausage flavor. The quinoa may have helped to make the quiche's texture heartier, but it didn't really impact the flavor. The peppers added a nice hint of freshness. The overall texture of the egg was fine and reminded me of quiches I'd made myself. The cheese was noticeable and tasty. I have no complaints to report. The Uncured Ham, Cheese, Quinoa & Peppers variety seemed to have less meat compared to the sausage one. It was quite a bit more salty and the texture - especially in the very center - was more wet than in the sausage version. These are somewhat nit-picky complaints. I suspect that most people who try it will have a generally good impression. As pictured on the boxes, both of these quiches look beautiful with specks of every key ingredient appetizingly visible. In reality, those colorful specks are mostly concealed within the egg. Final Word: I loved the sausage variety. I liked the ham variety. Both reminded me of homemade quiches. I recommend you give this product a try. 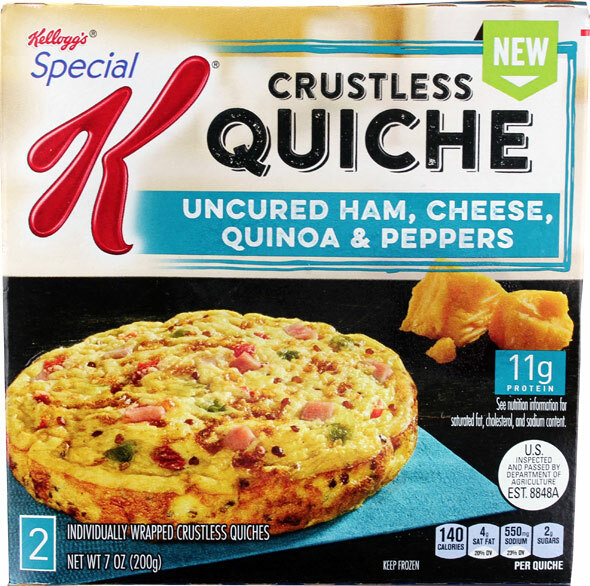 What do you think of Special K Crustless Quiche? Love these, especially on a whole grain sandwich round. Get them at Costco! Much cheaper. My go-to when I don't have a lot of time in the AM. Have tried a couple different ones and like them a lot. 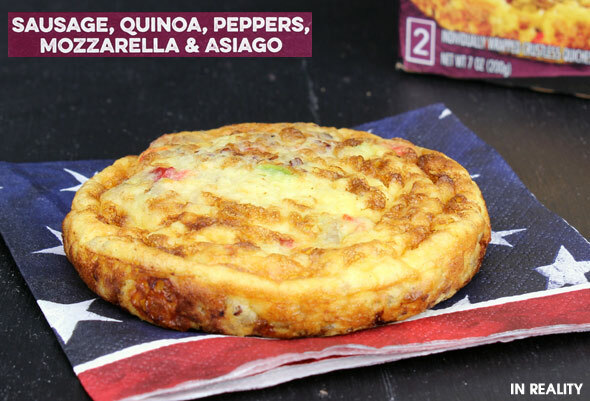 Quick and filling, good flavor. Super delicious! I'm having the sausage and peppers one and it's great. You can get it in bulk where it's cheaper at Costco. I love it. Are these gluten free? 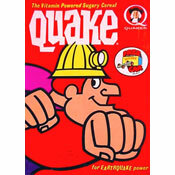 I don't see it in the ingredients AKA wheat, but there are so many hidden sources and the box does not say gluten-free. If anyone knows I'd appreciate that. Thank you. I enjoy each version... Awesome low-carb, high-protein product. Don't hesitate to give them a try! Fast and tasty treat. I like the kale & mushroom version and the ham versions of this quiche. I dress mine up a bit with black pepper and red pepper flakes, but even without, the flavor profile is good for a microwave meal. Impulse buy at the grocery store. I think they were $5.99. Pricey but I have to say I really liked it. Nice and fast 2:15 prep time. I topped mine with sriracha sauce. A good start to the day with a smoothie. Enjoyed Asiago version about 5 times; never gets dull. Has helped me maintain my new low-carb regimen as I don't like eggs in morning unless fixed fancy with all kinds of flavors. Added hot sauce and even better! I had the Uncured Ham, Cheese, Quinoa & Peppers Quiche. I would have rated it higher (perhaps even 5 eggs) if the dominant taste was not salt. I liked it very much especially since it's crustless and I'm thinking my doctors would approve of that part. I will be buying more! Delicious, but I paid $3.50 on sale. A little pricey in my area. The low carb load is good for my blood sugar. Eat with a salad and a small amount of fruit and you've got a meal. LaSuzie - There is a non-meat version. I had the Portabella, Quinoa, Parmesan, Asiago, & Kale Quiche this morning. Very good! 130 Calories and 10g of Protein. Please make a non-meat version. Delicious. 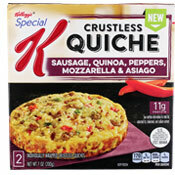 I just tried the Jimmy Dean version yesterday, and the sausage, pepper and asiago version of Special K this morning. Both are very good. AWESOME concept Kellogg's! 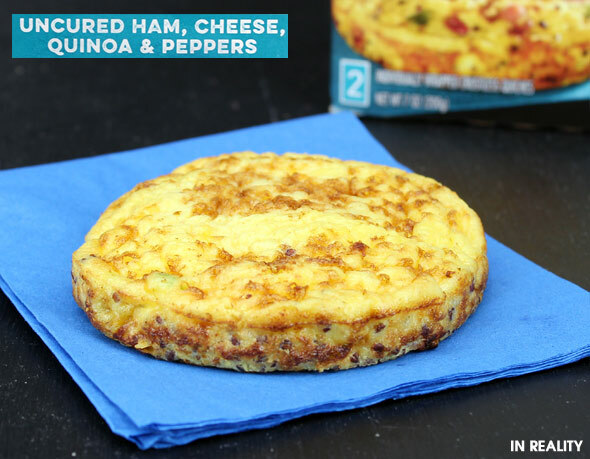 I've only tried the uncured ham quiche so far, but loved it! Very easy and convenient to take with me to eat at work in the mornings. Though I don't specifically follow a low carb diet, I am cognizant of the sugars I eat as a type II diabetic. Thank you!